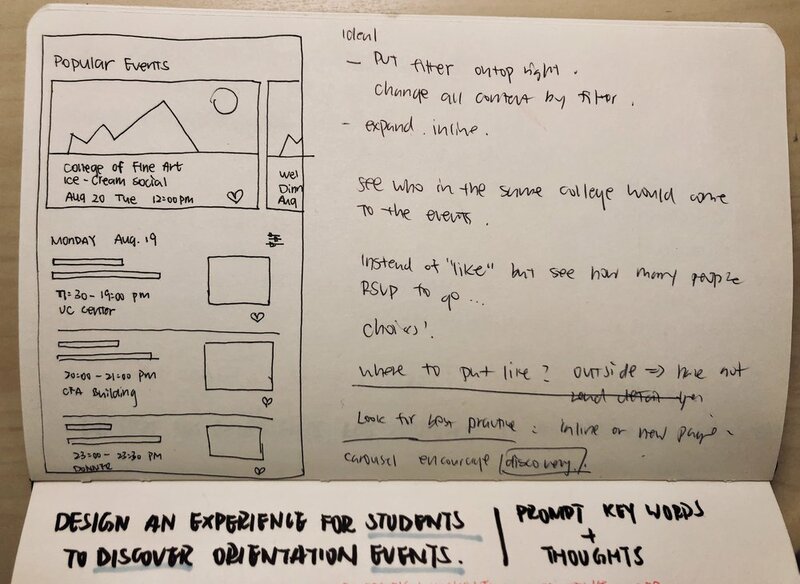 I designed an experience for new students at Carnegie Mellon to discover and search Orientation events that helps students to meet new friends with similar extra-curricular and academic interests. What’s the Current Orientation Experience Like? A visual system is created and utilized across the experience design. I took inspiration for the color palette by browsing through past orientation photos , with a feeling of energetic and vibrant. On the other hand, as new students at Carnegie Mellon come from over 50 states and 65 nations, inclusive design is especially valued when crafting the visual system. Colors are A11y colors and the font Source Sans Pro is one of the most accessible and widely use fonts. As making new friends is the #1 priority for most students during Orientation, popular events are featured on the top of Home Page. Another reason students attend events is that the events align with their interests, thus the events are also organized by extra-curricular & academic interests in carousel, allowing easy exploring. The event list page features events that are organized student’s extra-curricular and academic interests. Essential info such as name, time, location and number of students interested in going are shown on this level. The bottom section encourages students to explore other types of events. Click on individual event from card or list will bring up the detail page, which provides rich information. 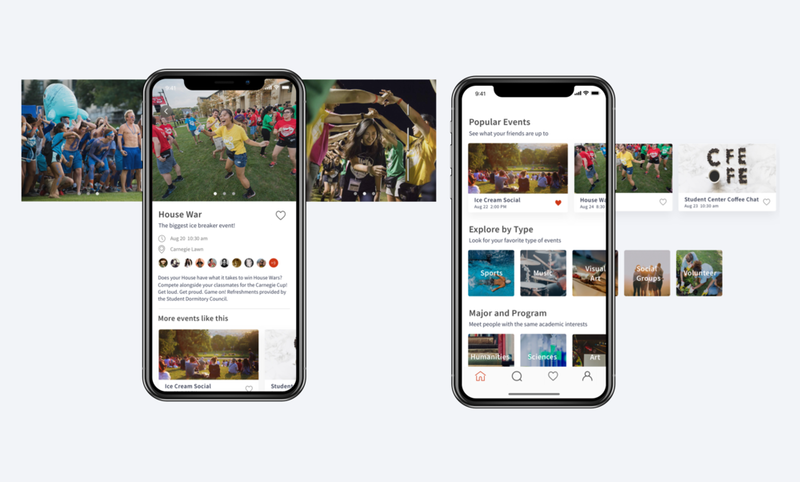 In particular, the detail page showcases high-quality photos of past event or poster of the event , and displays further info about other students who are interested in attending, thus making events more sociable and attracting. The search page is designed to encourage exploration. Users can directly type in the search field on top, or click on keywords to see the possible categories, thus exploring events for different time, location and type. To fully understand the task, I start by writing down some keywords, and my immediate thoughts on them. I also developed some initial questions to investigate for research. To get a better understanding of idea of what the current orientation events experiences are like, I conducted 6 in-depth interviews with students, mostly current freshmen, of different majors. I also went through literary review of Carnegie Mellon’s Orientation Schedule Brochure, the only source of orientation events information currently available for new students. Main insights are summarized below. I conducted usability test using Low Fidelity paper prototypes to understand the optimal way of organizing events and the detailed information. Since facilitating the discovery of orientation events is one of my design goal, carousels with event categories are widely utilized on the Home page to encourage browsing. Furthermore, through User Testing, users click through the Home page more when there is a mixture of groups and individual events. Therefore, I decided to layout event information both by group and by directly showing some events on the home page. If given more time, I want to think deeper about how might this new mobile app be integrated into the larger, existing CMU digital information hub such as the Bridge, where clubs post information, and the Hub, the home page of CMU enrollment services. I will not only interview current students, but also speak to more event organizers and CMU staffs to get a more comprehensive perspective on Orientation events. Insights drawing from these interviews may help me on the content strategy side of designing this new digital product. On the interaction design side, I hope to conduct further concept testing . I might consider storyboard the key ideas/features to conduct speed dating to see how CMU students react to those features, especially the dedicated search tab. Due to time constrains for this exercise, I only user tested with a limited number of students with my lo-fi paper sketches. Instead, I will ideally conduct usability test on high fidelity prototypes and thereby iterate on the high-fidelity screens more.